- Rare earth magnetic sensor that allow for up to a 2/5 inch gap. Monitor the status of door/window 7×24 hours after proper installed.When it is triggered,such as open,close or tampered,a push notification will be reported to your mobile Android or IOS systerm.You can check history records and battery leval in "SMART LIFE" APP also.Enjoy a sound night's sleep knowing that you and your family are protected. - Fast Instant Alerts:There are EZ or AP mode for wifi connection.A report will be send to your mobile within 3-10 seconds depend on your WI-FI net speed.You can get message anywhere and anytime.Also you can share device to family members by one click in Smart Life APP.Built-in auto dial function,so you do not have to reset it when restar Wifi router. 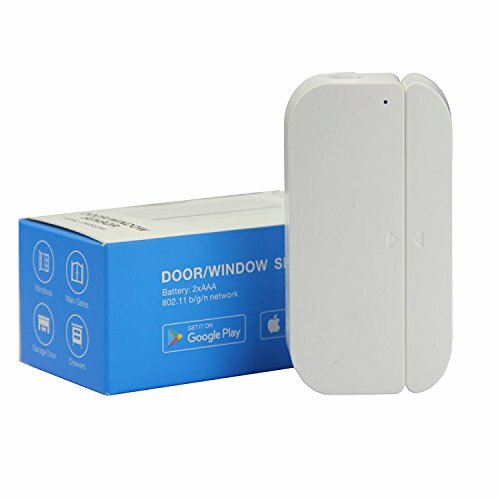 - Compatible With Alexa And Google Home:No hub required.It can perform auto control together with other smart device wich is compatible with smart life or IFTTT.You can set sevaral scenes.For example,set a "shower" mode in App,the bathroom smart light will be turned on automaticly when you close bathroom door.And light will be turned off when you open the door. - Easy Use Easy Installation:It is smart and small,can be attached to double hung or commercial windows,doors, sheds, cabinets, gates and more.The wireless and portable design allows you to install it in any section of your home, work, retail store, salon, or business.Up to 6 month battery life( 2×AAA Batteries are not included),double-sided mounting tape and 4 screw included in the package.